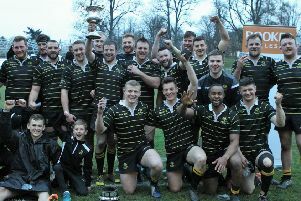 The third Hawick Linden Sevens took place at Volunteer Park on Saturday on a pitch heavy with midweek rain, but which managed to stand up well to an afternoon of entertaining rugby. Holders St Boswells were a late withdrawal, resulting in a group of four teams and another with only three. Pool A was topped by Berwick, who won all three of their games, with Hawick Harlequins runners-up, while Pool B was won by the hosts, winning both their games, followed by Jed-Forest. In an all Hawick semi-final, two Craig Russell tries, both converted by Kirk Ford, put Linden 14-0 up, but Quins hit back with tries by Dale Johnstone and Ross Anderson to make the half-time score 14-10. Linden stretched away in the second period through touchdowns by James Hogg, Ford and Conor Gracie, the latter two converting their own scores to make it 33-10 to the hosts. In the second semi, Berwick were always in control of their tie with Jed-Forest and a 34-12 win secured their progression. First blood in the final went to Berwick when a quick tap penalty saw Ally Grieve go over, with Jack Learmonth converting. Linden responded with Ryan Elliot dotting after a long run, before Ford went in at the posts. His conversion made the half-time score 12-7 to the hosts. A defensive mix-up allowed Berwick’s Tom Riddell a try that squared the tie at 12-12, before the Teries upped the pressure and a further two tries from Elliot brought the final score to 22-12, with Linden winning their own trophy for the first time. Club president John Tait presented Linden captain Graham Colville with the Life Members Cup. The medals, sponsored by the family of the late Billy Russell, were handed over by his good friend Bruce Logan. The player of the tournament trophy, donated by Moira Black, was presented to the referees’ choice of Jack Webster (Berwick). Linden thanked all clubs who supported the event and everyone who helped on the day.